The shock-absorbing panels are thermoformed in a vaccum and injected with nitrogen to create a grid system which follows body and bone patterns. This grid system creates channels on the inside of the vest which allows it to flex with the body while maintaining the best air flow possible. We use nitrogen injection so that the vest is not effected by tempature changes. A continuous outer skin witch is the IDS enables any shock of a impact to spread to a larger area for absorption. A protective shield made from 4th-generation ballistic material that is very simular to kevlar but even better at protecting you. This is inside the vest and is mechanically fastened to a thin, high-density sports foam. This ballistic material and foam distributes all the energy out and away from the point of impact. We took this technology from the bull riding side. Its been protecting bull riders from 2000 pound bulls, its got to do a great job of protecting you froma 200 pound dirt bike.The ballistic shock spreader is standard on all Ride Right vests. The MotoXvest classic features a heavy-duty brass zippered front to make it safer and easy to take on and off. Additionally, the zipper area is protected with high-density foam and ballistic IDS material behinde the zipper. The break-away shoulders separate and attach with a hook-and-loop fastening system for perfect sizing. The front of the vest overlaps the back at the sides with the ballistic IDS, for full side protection and maximum adjustability. The vest also has a tail section that is lower than the sides for added protection and double top-stitched seams to ensure longevity. Hidden hook-and-loop fasteners exist for size adjustment along with buckles and nylon straps to maintain stability of closure junction on the sides of the vest. The vest is designed for maximum body coverage across chest and under arms. The vest weighs in at less than 2 pounds, which is very light weight. The vest is designed to work with most neck braces, specifically the Omega and the Leatt neck brace. We spared no expense bulding this vest, everything is the best it can be. Motocross is a very dangerous sport and requires special armor and safety equipment, MotoXvest has that product. We sell thousands of the motovest all over the world, mainly for motocross and off road racing, but hundereds of the vest have been used for snow skiing, snow boarding, wind surfing and other types of extreme sports. Anything where protection of your core and vital organs are needed. 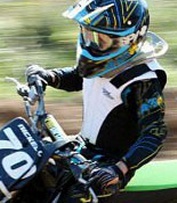 Our vest is the leading motocross vest in the industry in safety and comfort for kids and adults. Moto vest , helmet, neck brace and knee braces, are all products you want to put some time into researching which manufacturer is giving you the best product. Instead of just assuming that they are all equal. Alpinestar version is available as a custom order. The MotoXvest is made right here in the USA with your comfort and safety in mind.